As practitioners, we know how crucial it is to create a safe space when working with clients who have experienced trauma. But this can often be challenging . . . and nuanced. That’s because for many trauma patients, sometimes even a friendly face or a gesture of compassion can feel unsafe, even threatening. So what are some key ways we can avoid triggering clients and foster stronger feelings of safety? In the video below, three leading experts share their strategies. Check it out – it’s about 3 ½ minutes. 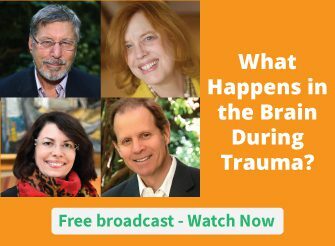 What strategies have you found effective for helping clients feel safe after trauma? Please share your comment below. Thank you for sharing, it is a great presentation. To add to this, I personally think that for a person to feel safe inside can only come from personal growth … For me, for a person to feel safe inside … As I have been in a relationship for years, I thought it could evolve from the self-affirmation and confirmation of one’s own conviction. I see at my client’s place that being present and holding it close to you gives them strength and a base to stand on when they are ready to move forward. And they do it. One step after another. Whenever they feel safer and stronger. Some would be open to showing some vulnerabilities if it had been useful in the past. My many relationships have failed and taken me apart. My thfreefailed marriages in some ways were all my fault in a sense I gave myself the permission to fail. I dropped out from high school, ran away, and got pregnant at sixteen. There was no growth behind it. It just felt safe for me this way. My determination was to get away from it. After many years of seeing my therapist, I have matured and give the love to myself as I deserve it and not judging the part of me as either good or bad, but as being human. Today, I live alone wth my two dogs in my beautiful flat. Now it feels safer for me to talk about it. Thank you for your reaction, Denis . I feel the same way. Deep listening and a lot of reassurance create not only a basic therapeutic alliance but also is nourishing for the heart and the mind. As a combat veteran I can attest to having space issues and wanting a clear line of sight to the exit. Creating a safe space is for me being able to open my heart and truly feel that I can speak my own voice. In my practice I have worked with veterans professionally for the last 12 years, I have found that deep listening, creating a friendly smile and greeting the person with respect and dignity, and putting their needs above my own, or what gives them reassurance and yes choices, and that’s part of my job is to help them see their choices. How the room is arranged, how the veteran feels, how anyone feels after a traumatic experience(s), all these things matter. Sometimes I just ask how do you feel and then let them know that I am here for them.